Paper wasps are one of the most commonly observed wasps in Canada and they are named for their habit of making paper nests. This species is dusty yellow to dark brown or black in colour and have little to no hair. Paper wasps are generally between 1.9 and 2.5 cm and have slender, needle-thin waists with oval eyes and long antenna and like both bald-face hornets and European hornets they have 2 legs that hang visibly when flying and they have no pollen baskets. Paper wasps are considered to be gentle, however if they or their wasps are threatened or disturbed they will become agressive and can sting their victim repeatedly by retracting their stinger. They are mainly predatory and will hunt small insects for food and to feed to t heir young. Their nests consist of open hexagonal cells built using paper–which is wood fibers mixed with the wasps’ saliva. They can collect the wood fiber from various sources such as dead wood, wooden structures and plant stems. Their nests hang down horizantally in protect spaces such as attics, eaves or can be found in soil cavities and they will rarely exceed the size of an outstretched hand with populations of between 15-200. Wasps will drink nectar occasionally, but they do it in order to get quick energy when hunting smaller insects and they will also use flowers as a hunting ground, since smaller insects are attracted to the flowers. 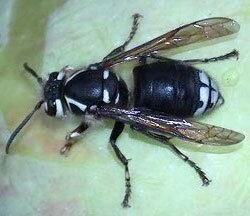 Wasps are beneficial in gardens and the environment because of their predatory nature. Wasps (and bees and hornets) are not necessarily a pest you want hanging around to closely to your home since many people do have allergies to them. Cottage Country Pest Control can come in and using IPM methods we can help make your environment safer for you and your family. To book an appointment or for more information email or call us at 705-534-7863. Today, is part 2 of a 3-part series on Bees, Hornets and Wasps. 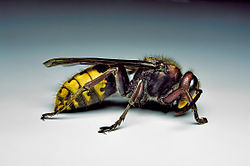 The first type of hornet I’ll be writing about is the European Hornet (Vespa crabro). This species is black and dark with yellow, they have deeply indented eyes (think c-shaped) with reddish-orange wings and their petiolate abdomen is brown striped with yellow and some hair. This species also has hair on their thorax. They can be as big as 3.5 cm and like the honeybee and bumblebee they have a gentle disposition. 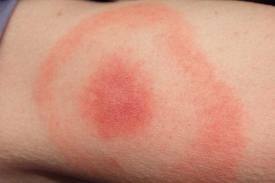 This means they won’t sting unless they provoked, stepped on or grabbed. They will however get defensive when their hives are threatened and they can become aggressive when it comes to food sources. In male European hornets the males have abdomens that have 7 segments and the females have 6 and the male antenna have 13 segments and the female antenna have 12. European hornets, unlike honeybees and bumblebees, will eat insects and they are also attracted to lights at night. Their nests are large paper nests and can be found in hollow trees that have sheltered positions. Bald-face Hornet or (Dolichovespula maculata) is also known as the white-faced hornet and the white-tailed hornet. Technically, this species belongs to the genus of wasps called yellowjackets but because they lack any yellow colour is it called a hornet. They are black with white ivory markings and can be up to 1.9 cm. They also have 2 visible legs that hang when they are in flight and they lack pollen baskets. Similar to the European hornets, the Bald-face hornet also eats other insects. This species of hornet is found throughout North America including parts of Canada, the Rocky Mountains, the Western Coast of the United States and most of the Eastern United States. Bald-faced hornets are known for their large football-shaped nests, which they build in the Spring for raising their young. There have been some known cases, where they have built their nests as big as 3-feet tall. They are also extremely protective of their nests and will sting repeatedly if the nest is physically disturbed. They are more aggressive than both yellowjackets and other member of the Vespa genus. 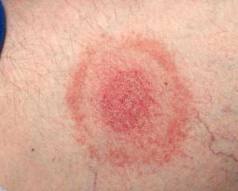 When this species stings, they are able to retract their stinger and stinging their victim won’t kill them. Basically, you don’t really want hornets hanging around your home especially if you or someone in your family is allergic to their stings, so Cottage Country Pest Control can come in and using IPM methods we can help make your environment safer for you and your family. There are over 1000 native species of bees in Canada, but the honeybee is not one of the native species. Honeybees were originally from Eurasia where they have been a domesticated species for centuries. All the “wild” honeybees we have in Canada are from colonies that escaped from domesticated hives. Bees are able to live year-round and their hives are self-sufficient as long as the colony is able to collect enough nectar and pollen during the summer. They have been able to adapt to the Canadian climate and to life in our forests and woods since they have the ability to generate their own heat in order to warm their hives in the colder months. 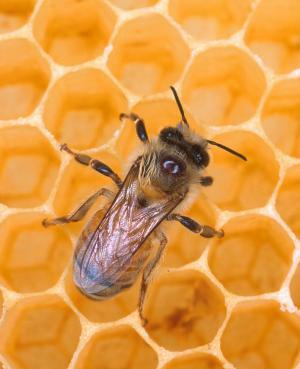 Honeybee population has unfortunately been in decline due to two types of parasitic mites that have infested many hives in the past few decades. Wild honeybees in Eastern Canada have been nearly exterminated by these parasites and the infestation has spread to a large number of domestic hives. These losses, in addition to the loss of wild habitat, the effects of pesticides in and around agricultural operations and the transmission on other bacterial diseases from hive to hive mean that the numbers are continuing to decline rapidly. Honeybees are amber to brown in colour with alternating black stripes. They are furry (with short hair) and are approximately 1.3 cm. They eat nectar from flowers and when they sting (which they won’t do unless provoked as they are considered gentle) it will kill them. Honeybees live in large colonies in flat wax-based honeycomb hives that hang vertically. Bumblebees lived in the wild for thousands of years before people started capturing them in order to domesticate them. Unlike honeybees who have short tongues, bumblebees have long tongues which means they are able to pollinate a larger variety of flowers. In the late 1880’s, researchers began to think about using bumblebees to their advantage when it came to agricultural matters. In 1885 and again in 1905, hundreds of bumblebees were captured and introduced into New Zealand in order to try and improve the production of red clover seed. 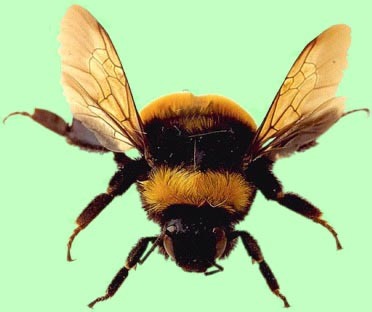 In Canada, the bumblebee was first used commercially in 1990 as a tomato pollinator. Throughout the world there are 5 species of bumblebee that are commercially reared. In North America only 2 are used commercially–the Bombus impatiens and Bombus occidentalis. The B. impatiens species is very successful in being used as greenhouse crop pollinators and recent studies have shown that “only 7 to 15 colonies are needed per hectare of greenhouse tomatoes, which is equal to approxiately 2000 bee trips per hectare, per day”. Bumblebees are yellow with black stripes and are furry, but with long hair. They are considerably larger than a honeybee at 2.5 cm but like the honeybee they also eat nectar from flowers and their stings will kill them also. They too are considered gentle and will not sting unless provoked in someway. Bumblebees can be found living in the soil in small cavities. Yes, honeybees and bumblebees are beneficial to the environment and agriculturally but that doesn’t mean you necessarily want them building hives around your home or cottage. Especially if you or someone in your family is allergic to their stings, so Cottage Country Pest Control can come in and using IPM methods we can help make your environment safer for you and your family. 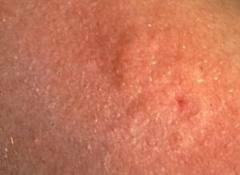 This post will show you some pictures of different bug bites….while they ca n give you an idea of what bit you, it’s important to know that some people react differently to different bites and if you aren’t sure about the bite(s) or if you start having any unusual reactions GO SEE A DOCTOR! If you have a cat or a dog (or some combination) then you probably have dealt with fleas at some point or another. 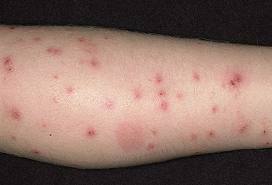 The most common type of flea found in North America is the Cat flea (ctenocephalides felis) and despite its name can be found on dogs and humans. Another type of flea that is sometime found in North America is the Dog flea (ctenocephalides canis), though this one is more commonly found in Europe. 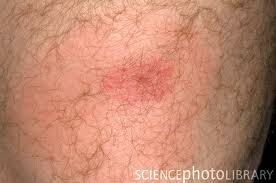 Adult fleas are approximately 1/8-inch long and are dark in colour, ranging from brown to reddish-brown. 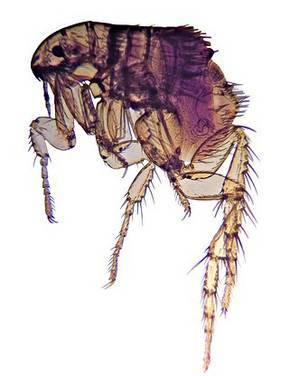 Adult fleas are wingless but can jump large distances because of their 6 legs. They have thin and flat bodies and are covered in hair that helps root them into their hosts. Fleas have 4 stages in their life cycle: egg, larva, pupae and adult as you can see in the life cycle diagram on the right. In order for an adult to lay eggs, she must have a good bloood meal before she can lay up to 40-50 eggs a day. A female will lay her eggs in a host’s fur, however the eggs will roll out in order to develop in carpets and baseboards. Once the eggs hatch, the larva will crawl into cracks and crevices looking for food. Larva are completely blind, however they are considered negatively phototaxic, which means they can sense light. Larva will primarily feed on dried blood in adult flea feces, but they will also eat shed skin, fur and feathers. Doesn’t that sound yummy? The next stage in the flea life cycle is pupae. After the flea reaches this stage, they can remain dormant for several months until the conditions are right for the adult flea to emerge. For them, the ideal conditions include pressure, vibrations, presence of carbon dioxide, correct temperature and humidity. When these are right, it means there’s a suitable host that the adult fleas can use as a food source. Adult fleas need an ideal food source, because they can’t survive for more than a few hours otherwise. 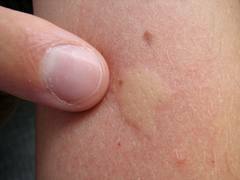 Identifying whether or not you have a flea infestation is a relatively easy task. The difficult part comes when trying to get rid of the infestation. If your pet is excessively scratching, it would be a good idea to check his or her fur for signs of fleas. 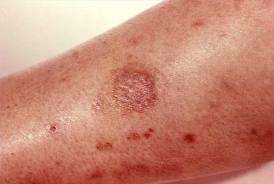 Some signs to look for (aside from the obvious excessive scratching) is reddened skin, flea dirt (which is not actually dirt, but dried blood) and another obvious sign: fleas! If you discover fleas on your pet(s), then you should contact your vet about treatment for the animals. That’s the easy part. Just confirming that your pet has fleas will unfortunately not confirm just how bad the infestation is, since adult fleas found on pets only comprise about 5% of the total flea population. Treating a flea infestation take patience and time. 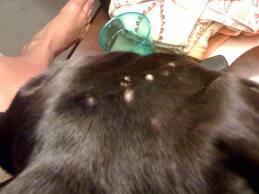 By applying a spot treatment to your pet(s)’ fur, you will be able to fight the fleas found on your animal(s). However, to treat the fleas located in your home, you have 2 options: find a home remedy (which are NOT always effective or hire a professional, such as Cottage Country Pest Control to help rid your home of fleas. Fleas can and will settle into a person’s hair (they can do this in less than 10 minutes). 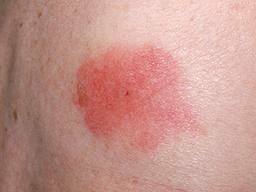 Fleas on a human head can cause soreness and itchiness. 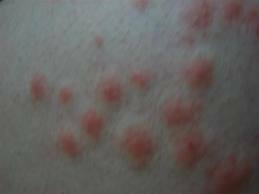 In order to treat the side effects, there are a few options such as anti-itch creams, antihistamines, hyrdocortison or calamine lotion. Because a flea has multiple stages in their life cycle, it can be difficult to wipe out an infestation with a short-term treatment. Treatments that only kill the adult fleas, will not work because as already noted, adults only make up a small portion of the population and larva can stay dormant for months. For a treatment to be successful, it needs to kill the fleas at all stages of their life cycle and be on-going for at least a few months to ensure that larva that have been dormant, will be killed when they emerge as adult fleas. Cottage Country Pest Control can help rid your home of fleas at all stages of their life cycle, using one or more of our treatments for fleas. For more information, pricing or to book your appointment contact us today. Wood cockroaches, or wood roaches are similar in appearance to that of a German cockroach (household roach). Both species are common in North America, but today is all about the wood roach. Wood roaches are common outdoor dwelling insects that are native to North America and are found throughout Ontario. They are most commonly found in moist woodland, ground litter, mulch, firewood, potted plants, shingles and rain gutters. Wood roaches are not dangerous—just more of a nuisance, especially when they enter homes. Their common food source is decaying organic matter and unlike other roaches (German roaches for example) they are attracted to light sources. Wood roaches have a flat, oval body with long antenna, spiny legs and an overall chestnut brown colour. A male is usually about 25 mm while a female is up to 19 mm and generally the males appear to have a bit of a tan colour because of the colour of their wings. Adults and large nymphs of the wood roach can be recognized by the pale, creamy white or transparent stripe on the outer edge of the thorax. The pale edge extends onto the first 1/3 of the front wings on adult roaches. Wood roaches that have entered a home will act differently than other roach species simply because they are not secretive, they are active day and night and they are less likely to run when approached. They will also wander around a house, without stay localized to a specific area such as the kitchen. 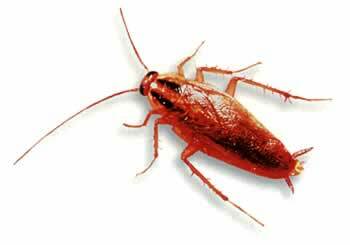 Unlike other species of roaches however, wood roaches will not thrive or reproduce indoors, because they require specific habitat to do so. They need a consistently moist environment such as under wood piles, loose bark and decaying logs into order to reproduce. Wood roaches will not harm your home, the furnishings or you, but they are an annoyance that can be controlled by yearly treatments and habitat modifications. If you have a wood roach problem, give Cottage Country Pest Control a call at 705-534-7863, or email us at ccpestcontrol@gmail.com and Ross will be happy to help you solve it.